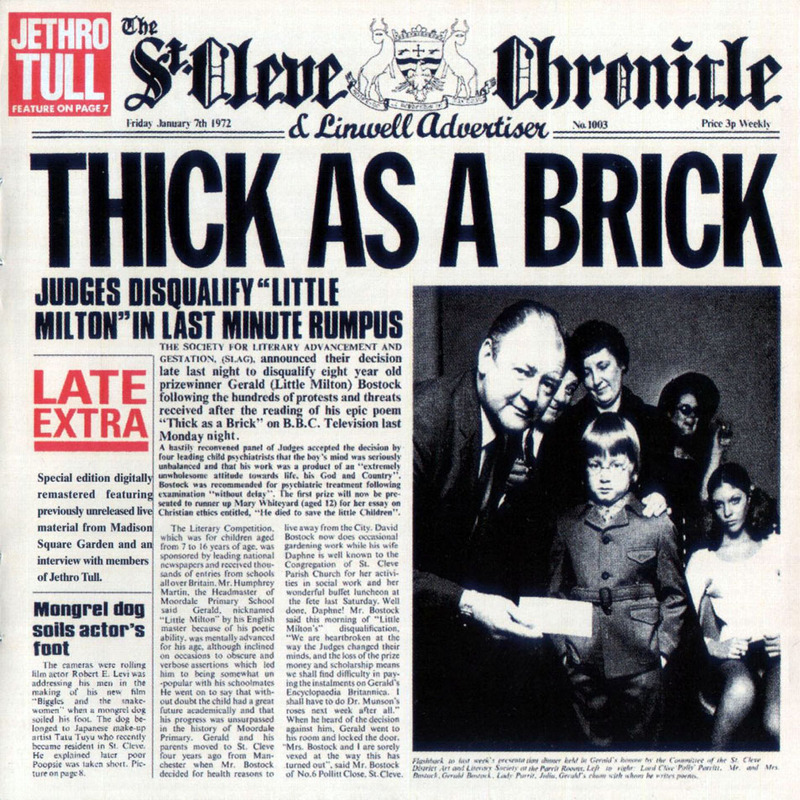 “Thick as a Brick” is perhaps Jethro Tull’s definitive progressive rock album. Born from a desire to really produce a concept album after the rock critics so dubbed the previous year’s “Aqualung,” the record features a rock first: one continuous song on both sides. The music, and the lyrics, are challenging to the listener and reflect complex influences of folk, jazz, and rock. With “Thick,” Anderson and company broaden rock beyond the limitations of the short song format. Understanding “Thick” requires recognition of the popularity of Monthy Python in the early 1970’s. Anderson meant for the album to be a send up of rock pretentiousness, critics, and the band itself. The album cover claimed, outrageously enough, that the lyrics had been written by an eight year-old boy, Gerald Bostock, and set to music by the band. Even today, Anderson still gets the occasional person asking about Bostock or commenting about the prodigy’s advancing age. 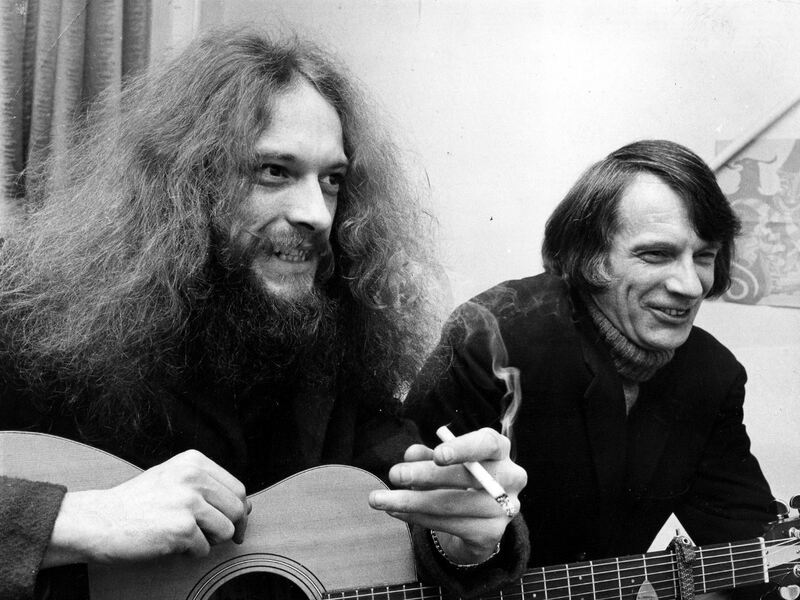 While the “Aqualung’s” lyrics are fairly straightforward, “Thick’s” metaphorical tendencies ” are intentionally intricate, obscure, and bewildering as part of the running joke. If there is any true central theme, perhaps it is the sociological experiences of gifted youngsters in the modern world with a touch of paternal relations again. The lyrical incohesiveness, far greater than “Aqualung,” leads Craig Thomas, who penned Tull’s 25th Anniversary Set booklet, to seriously question whether it is properly deemed a concept album. Rather, he views it more of an adaptation of the “kind of free-jazz…improvisations of the 1960.” Indeed, several segments were recorded in just one improvisional take. 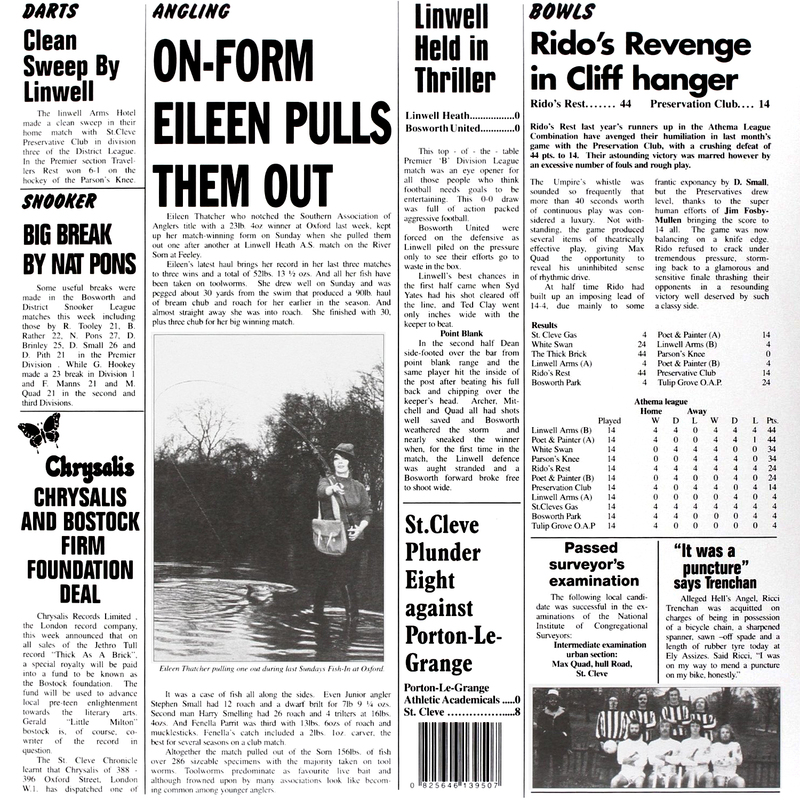 No discussion of “Thick”” is complete without noting the legendary 12-page newspaper, “The St. Cleve Chronicle” original cover packaging. Written by Ian, Jeffrey Hammond, and John Evan, the paper actually took longer to produce than the music. There are a lot of inside puns, cleverly hidden continuing jokes (such as the experimental non-rabbit), a surprisingly frank review of the album itself, and even a little naughty connect-the-dots children’s activity. The 1972 tour featured the entire album (with a brief break featuring comedy skits between sides). The tour established the band’s reputation for often outlandish theatrical-type performances. By today’s standards, the concerts were hardly major productions. But for the time, Tull was rather unique.